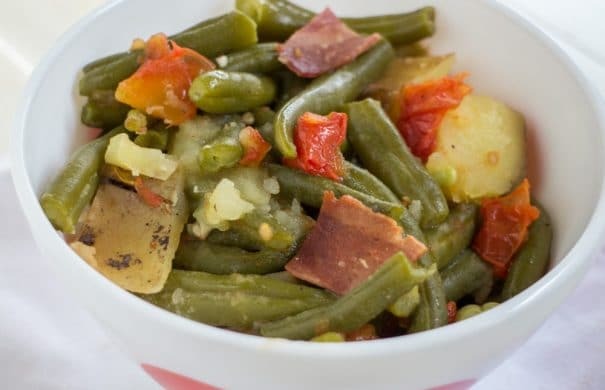 I Googled “Slow Cooker Green Beans and Tomatoes” but surprisingly nothing existed that actually used the crock pot so it was time to make my own slow cooker green beans recipe! I’ve been making slow cooker meals a few times a week because it’s much easier with the baby. While wearing her I can quickly cut up the veggies, prepare the rest of the ingredients and toss everything in the slow cooker. Last week I made this Slow Cooker Green Beans recipe and it was such a hit that I had to share it with you! The star of the meal is the vegetables. 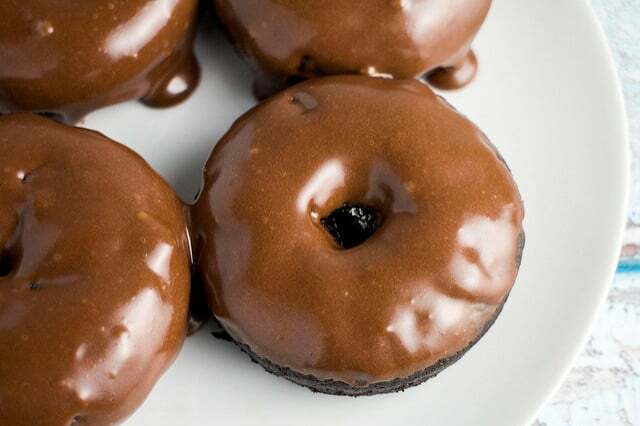 Besides that, the ingredients are basic and you probably have them in your pantry already. Throw everything in your slow cooker, cook it for 4 hours on low and then serve it. If you want to make your holidays less stressful, then go for easy and healthy Thanksgiving recipes like this one! 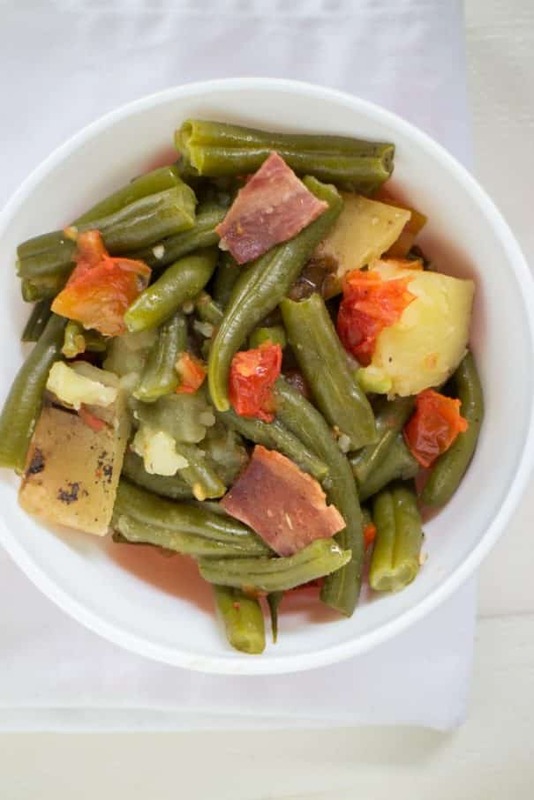 This is the perfect green beans recipe to serve with your favorite turkey recipe. I suggest you skip the Green Bean Casserole and go for this slow cooker recipe instead! You could easily serve this over rice, or you can make it as a side dish to a meat. It would be a great side as vegetable side dishes with chicken breasts, sausage or dinosaur shaped chicken nuggets like we had. It’s also perfect as vegetable side dishes for holiday dinners. 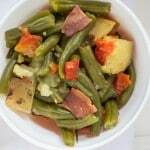 I hope you enjoy this Slow Cooker Green Beans Recipe with Tomatoes! More healthy thanksgiving recipes to try this holiday season: Blueberry Thanksgiving stuffing and Cheesy Broccoli Stuffing Casserole. 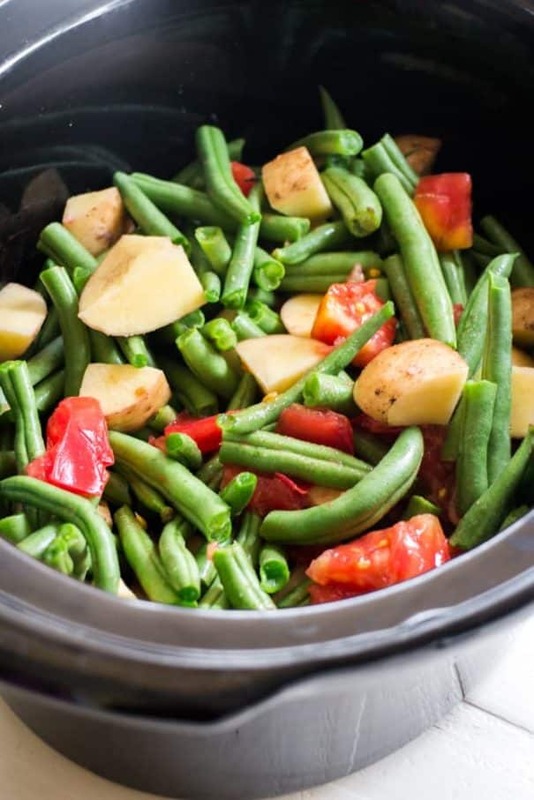 SLOW COOKER Green Beans and Tomatoes! 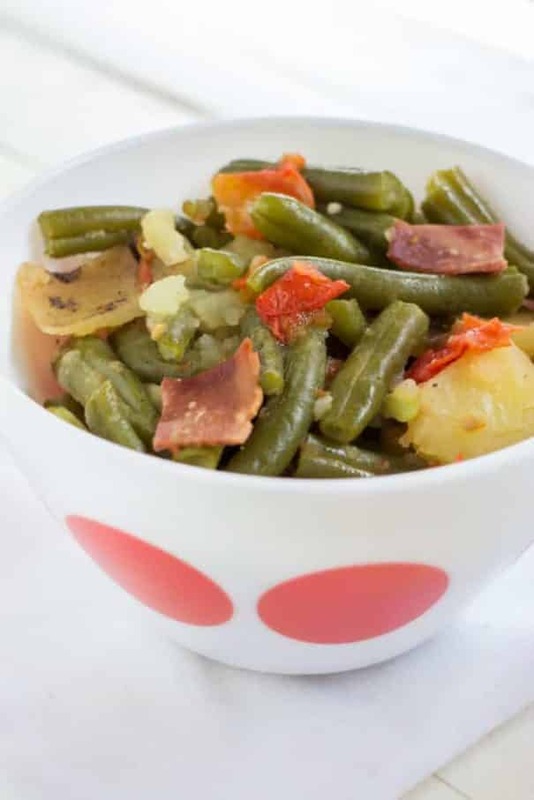 This easy recipe cooks fresh green beans, tomatoes, potatoes and bacon in a crock pot for 4 hours. This is a healthy dish that you can serve over rice or as a side dish to chicken or Thanksgiving holiday dinners. This has been become one of families favorite meals! Add all ingredients into a slow cooker and stir. Cook on low for 4 hours. Serve as a side dish with meat or a main dish with rice. I don’t have a slow cooker but I’m sure with baby it’s much needed for you right now. Me too!!! Living in the tropics now means I don’t get to play around with the too easy slow cooker dishes so I’ve been making lots of slow cook foods. I love this one so thanks for inventing it, will be making this one for sure. I make a version of this in a slow oven — braise it for 6 or more hours. I sometimes add mushrooms to mine. Anyway, this looks wonderful — thanks. Totally believe that you need the slow cooker to make your weeknights easier with a new baby. I love green beans and tomatoes, so this looks like an awesome choice for our family. Thanks so much for sharing at the #happynowlinkup! I need to back to using my slow cooker, this looks like a great dish and I love green beans. Hey Ashlee, thanks for commenting! I’m so glad you enjoyed this green beans dish! Hey Lola, thanks for sharing your tweaks! I hope you enjoyed these green beans!